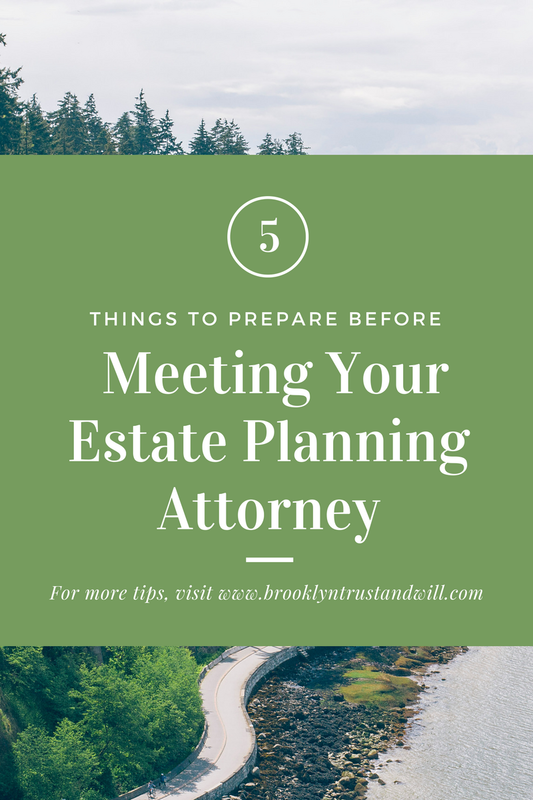 Estate plans are often drafted to leave your wealth and assets to your family. 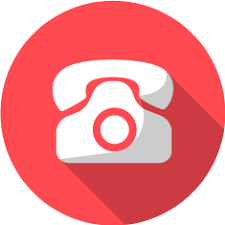 You’ll need the full names, nicknames, ages, and contact information for your current and former spouse(s), children (even if they’re not in your plan), stepchildren, and grandchildren. 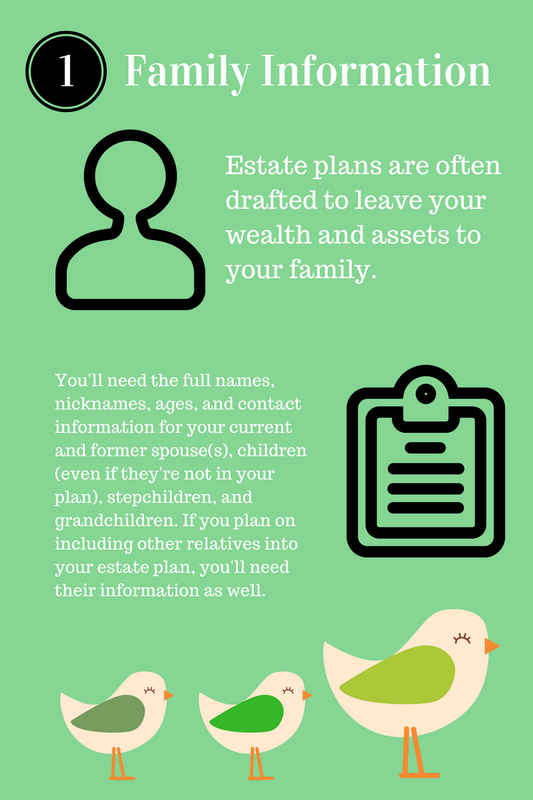 If you plan on including other relatives into your estate plan, you’ll need their information as well. 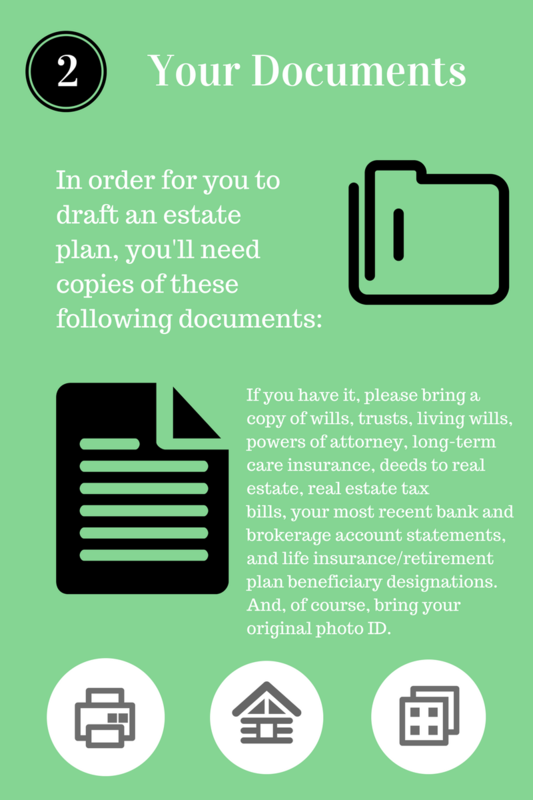 In order for you to draft an estate plan, you’ll need to bring certain documents to your estate attorney which include a will, trust, living wills, powers of attorney, long-term care insurance, deeds to real estate, real estate tax bills, your most recent bank and brokerage account statements, and life insurance/retirement plan beneficiary designations. Of course, you will also need an original government issued photo identification card. 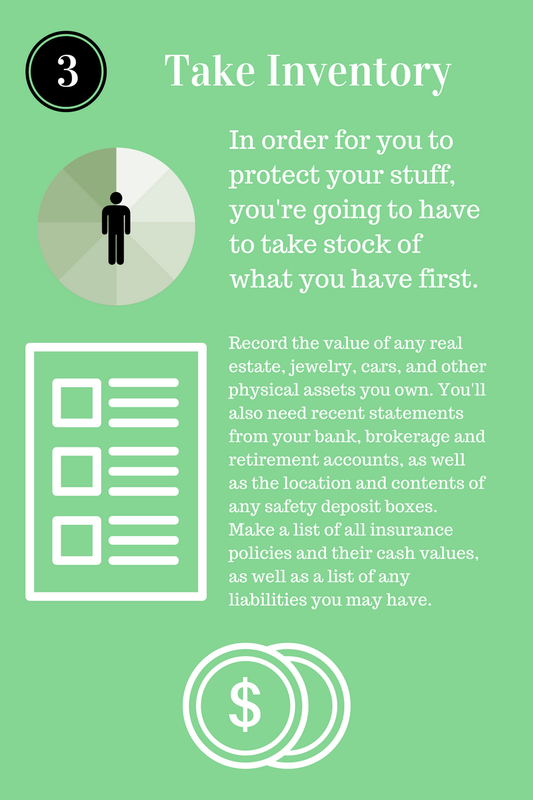 In order for you to protect your stuff, you’re going to have to take stock of what you have first. Record the value of any real estate, jewelry, cars, and other physical assets you own. 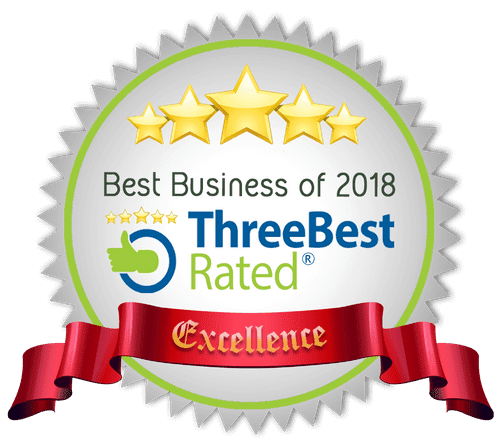 You’ll also need recent statements from your bank, brokerage and retirement accounts, as well as the location and contents of any safety deposit boxes. Make a list of all insurance policies and their cash values, as well as a list of any liabilities you may have. 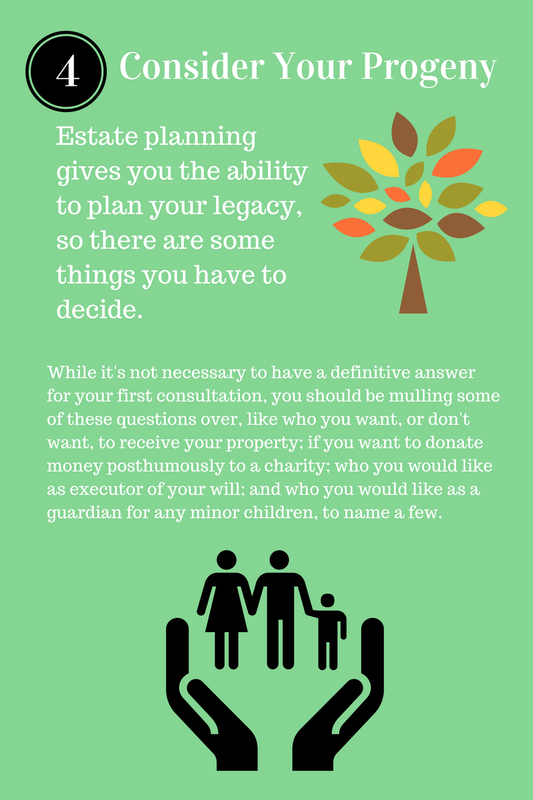 Estate planning gives you the ability to plan your legacy, so there are some things you have to decide. While it’s not necessary to have a definitive answer for your first consultation, you should be mulling some of these questions over, like who you want, or don’t want, to receive your property; if you want to donate money posthumously to a charity; who you would like as executor of your will; and who you would like as a guardian for any minor children, to name a few. 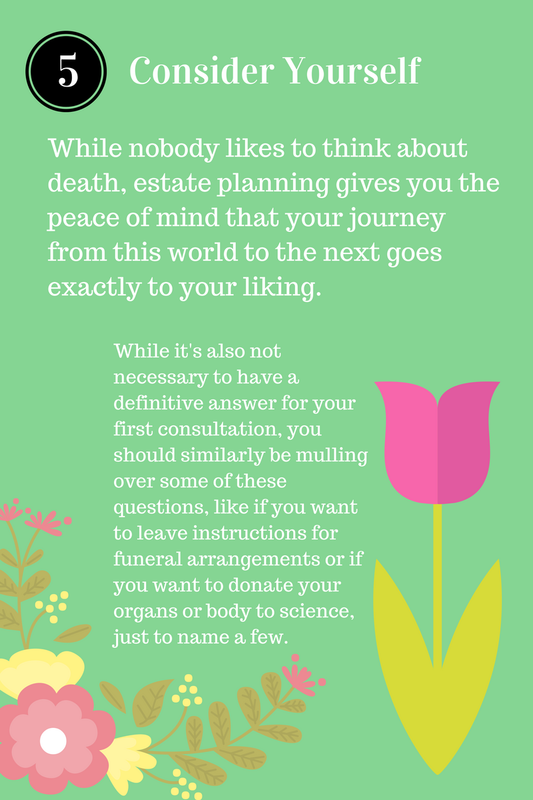 While nobody likes to think about death, estate planning gives you peace of mind that your journey from this world to the next goes exactly to your liking. Having an estate plan allows you to leave instructions for funeral arrangements if you want to donate your organs or body to scientific institutions, or perhaps someone in need. Next → Next post: How Will Gifting Affect My Eligibility For Medicaid?